Patterned much like old Clejuso cuffs. These cuffs are made by A. W. Naht of Hamburg, Germany. Differences between these and Clejuso cuffs include a serial number on the case and a slightly larger keyway (a Clejuso key WILL work on these). The inner workings are somewhat different too. 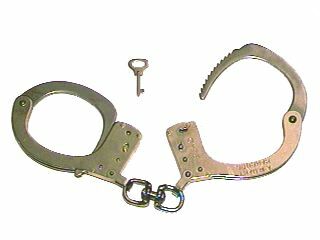 Billed as a "military" or "MP" handcuff. These were produced and used in the 1980's.